Kevin Connor’s love and talent for drawing resulted in him becoming the only artist to twice win the Dobell Prize for Drawing (1993 & 2005). But as a further indication of his prodigious talent, he is also a dual winner of both the Archibald (1975 & 77) and Sulman Prizes (1991 & 92). He paints city life and its people and is one of Australia’s foremost contemporary painters. Kevin Leslie Connor was born in 1932 in Sydney, NSW. In 1947 he was apprenticed to commercial art, attending night classes in drawing and painting at East Sydney Technical College. During the 50s he travelled extensively, painting and studying in Europe, the US, and the Middle East, living for extended periods in England and Spain. He was awarded the Harkness Fellowship in 1966 and resided and worked in New York until 1968, before returning to Sydney where he lectured in painting and drawing at the National Art School and City Art Institute. Connor is a compulsive drawer, taking his sketchbooks everywhere with him, detailing daily observations of people in pen and black ink - where they live, work, play and congregate. He uses these sketches as the basis for paintings which are usually on large sheets of paper in charcoal. Connor has had many exhibitions in Australia and overseas, including a retrospective in 1989 at the Art Gallery of New South Wales, and has been included in numerous group exhibitions. 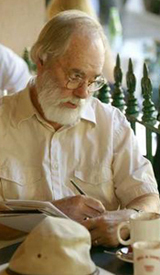 His works are held in all major public and private collections in Australia.